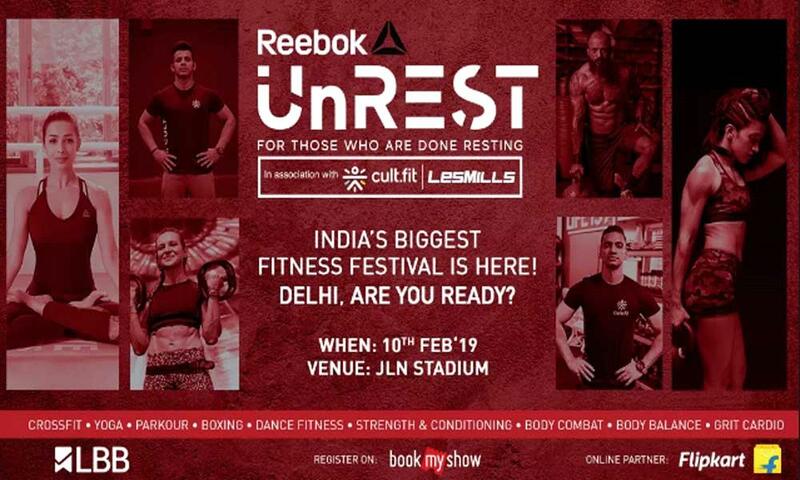 Reebok UnREST Delhi Fitness Festival 2019 is going to happen on 10th February 2019 at Jawaharlal Nehru Stadium, New Delhi. Reebok Unrest in association with Cult.Fit | Les Mills conducts India's biggest fitness festival, Reebok Unrest. Now, Reebok is coming for the first time in Delhi. The sessions also feature Yoga session with Reebok's Fashionably Fit ambassador Malaika Arora, a power-packed CrossFit challenge by Reebok master trainer Shivoham to Cure. It’s a good chance to be a part of the most exhilarating and thrilling workout sessions with our master trainers and show your talent to the world.